You are currently browsing the tag archive for the ‘The Child Garden’ tag. Something, something has got to happen soon, Milena thought. I need something new to do. I’m tired of the plays, I’m tired of the Child Gardens, I’m tired of being me. I’m tired of sitting bolt upright on the edge of my bed all night, alone. I need someone. I need a woman, and there isn’t going to be one. They’ve all been cured. The viruses cure them. Bad Grammar. I love you is Bad Grammer? Some years ago I bought Geoff Ryman’s book Was, a unique take on Baums’ The Wizard of Oz , in a sale. I never got a chance to read it and eventually sold my copy, along with most of my possessions, the first time I moved to Australia. Now I feel like running to the largest book store I can find in Sydney and hunting it down. I have not been this excited by a writer since I first discovered Samuel R. Delany. 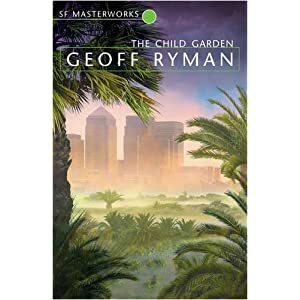 In a brisk introduction titled Advances in Medicine (A Culture of Viruses), Ryman establishes his vision of this future London and the principal character a Czech orphan named Milena Shibush. Cancer was cured via a contagious benevolent virus that rewrote DNA to allow the human body to photosynthesize sugar internally, preventing the triggering of tumour cells metastasizing due to genetic damage. The viruses continued to mutate, becoming intelligent and coding information into each new host, until a hive-mind developed called the Consensus, which directed and guided humanity. Culture and history became transferrable diseases, with newborn infants suddenly becoming infested with the collected works of Shakespeare, annals of past events and languages. Utterly transformed, the skin tone of the human race is now a universal russet purple. Also, the curing of cancer had an unexpected after-effect – no one lives beyond thirty-five. Got all that? Good. Milena is not like the other children. Her parents are deceased. The virus payload never took as an infant, so she was forced to actually read as she was unable to keep up with the other children. At the age of ten children undergo a process called being ‘Read’, where all their experiences are distilled by Consensus in order to determine what their future professions should be. Milena has never been Read. When she finally received a payload of viruses that took it caused her to become so ill she was deemed unsuitable for the process. After she recovered, it seemed to her as if Consensus had forgotten to harvest her. She was placed as an actress in London. She is different, estranged from the other adolescents and children, more impulsive, imaginative, distrusting of the viruses and due to ‘Bad Grammar’ is attracted only to women. Milena’s loneliness and lack of interest in the robotic performances of Shakespeare she has to take part in as part of her ‘career’ – every actor recites their lines and paces the stage exactly as Consensus tells them the original performers did, in a perfect recreation of the Elizabethan era – leave her feeling increasingly isolated, until one day she meets the love of her life. One day she hears a voice sing with a richness and understanding superior to any recording. The singer in question is a genetically engineered polar-woman named Rolfa, descended from humans who chose not to join Consensus, but become intelligent polar-bears instead. Unlike the socialist Utopia of the purple-skinned humans, the ‘G.E.’ polar bears mine for ore in the Antarctic and sell it for profit. They are the last capitalists. Rolfa, like Milena, is a freak who enjoys opera and poetry instead of business. Where the ‘squidgy’ girl is paranoid and reserved, the woman who looks like a bear is raucous and inspiring. Their love is not permitted by either Consensus or Rolfa’s Family, forcing them to make a tragic choice. Milena dedicates her short life to orchestrating her lover’s opera based on Dante’s The Divine Comedy. I have not even scratched the surface of this amazing book. Ryman’s characters are fascinating creations – the dangerously deluded Thrawn McCartney, Cilla an actress colleague of Milena’s so good she cannot actually tell whether she is self-conscious or acting – contained within an elliptical and time-jumping plot. The intelligent viruses resemble Richard Dawkin’s theory of memes, which he wrote about in The Selfish Gene ten years before The Child Garden was published. This is an exhilarating mixture of science and culture, a novel set in the future that revolves around Dante’s epic poem.